Summary: Growing up with a younger sister dealing with cerebral palsy, David is used to being independent and coming second in his parents’ attentions. In love with the girl across the street, David’s attraction only grows when Heather shows she is comfortable being around Ivy and his parents. But a trip to the family cottage changes everything when David’s dad takes Ivy for a swim and she has a seizure and dies. When questions are raised about whether Ivy’s death was accidental or intentional and David’s father comes out with a startling confession, David examines his sister’s life and ponders whether her death was a crime or an act of mercy. Review: A subtle, quick read about a brother’s love for his disabled sister, What Happened to Ivy by Kathy Stinson examines the effect of euthanasia on the lives of a modern family. Stinson creates characters easy to empathize with as her story provides insight into David’s parents, worn out from caring for their high needs daughter with seemingly little reward. What bothered me though was Hannah. I understood her being drawn to David’s father because she was lacking a father-figure in her own life, but she seemed to become attached to him in the blink of an eye. This attachment influenced other events in the book, which I found difficult to believe because I was skeptical of it in the first place. It is David that captured my attention though as he tries his best to sort through what happened to Ivy. Knowing he isn’t exactly blameless because he also had times when he was frustrated by his sister’s medical situation and all of the attention it took, David still demonstrates that underneath all of his conflicted feelings about his sister there was love, and a belief that her life was worth something. Stinson’s book challenges her readers to think for themselves, as it does not provide any easy answers. Instead, David is left at the end of the novel still pondering if his dad did the right thing or not and readers will be left doing the same. “I should have brought Ivy here. She would have liked how the sunlight dances in patches where it’s filtered through the tall trees. She was always noticing stuff like that. And giggling. Like she did in the bath. Even if you didn’t know what she was giggling about, when Ivy giggled, it made you want to giggle, too. 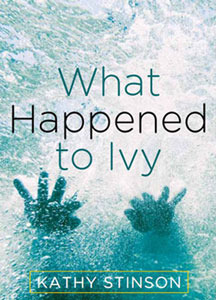 What Happened to Ivy by Kathy Stinson is published by Second Story Press, (2012).